This past weekend I’ll admit I needed to desperately go grocery shopping. We were out of many basics including milk which made preparing something extra yummy for a weekend breakfast tougher. But sometimes I surprise myself by digging deep within my refrigerator and kitchen cabinets to come up with something scrumptious for breakfast. I happened to have some Pillsbury Grands Flaky Buttermilk Biscuits which worked perfectly to create a quick and awesome pull-apart bread that my family loved. 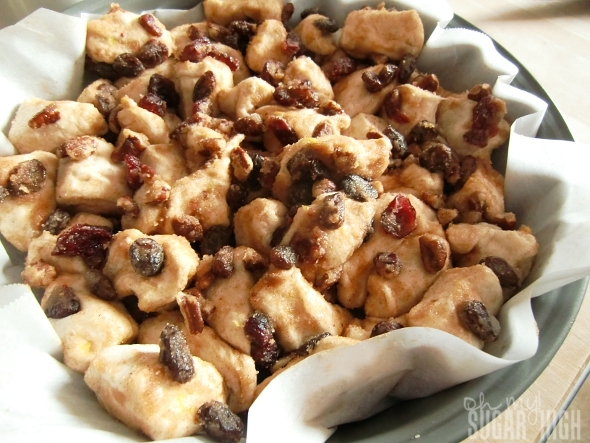 I used a combination of raisins and dried cranberries and loved the light flavor the lemon peel added in this recipe. I served it with bacon to make it more filling and because I thought it might be extra sweet. While it was a sweet treat, it was not over the top and had a fabulous flavor! This is as it appears right out of the oven. Sometimes a picture says it all. Yum! Heat oven to 375°F. Line bottom of 9-inch round cake pan with waxed or parchment paper. Mix together all ingredients except biscuits in a large bowl. Separate biscuits and cut each biscuit into 6 pieces. Place biscuit pieces in sugar mixture and use your hands to toss to coat. Arrange in single layer (as much as possible) in paper-lined pan. Add any remaining sugar mixture over the top. Bake 20 to 25 minutes or until a deep golden brown. (You want to be sure the center is completely cooked through) Run knife around side of pan to loosen if necessary. Place serving plate upside down over pan and turn plate and pan over. Remove pan and paper. Viola! 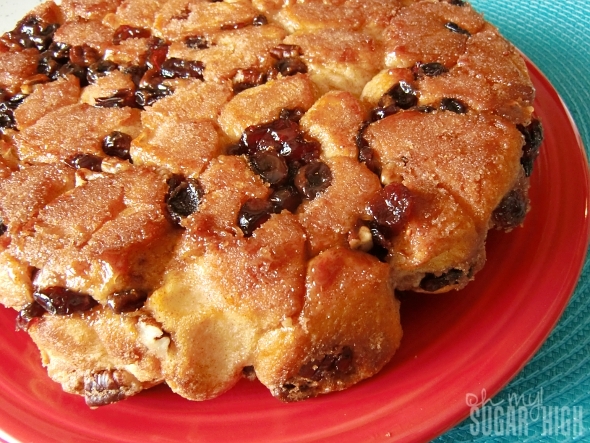 Cut coffee cake into wedges or pull apart as we did. Serve immediately. 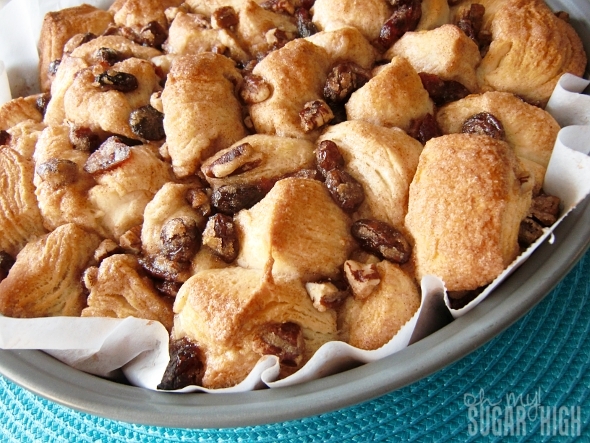 This recipe was inspired by a Pull-Apart Coffee Cake from Pillsbury. Looks good! Well written recipe too! We’d like to invite you to submit your food photos on a food photography site called http://www.foodporn.net so our readers can enjoy your creations. This looks so delicious!! 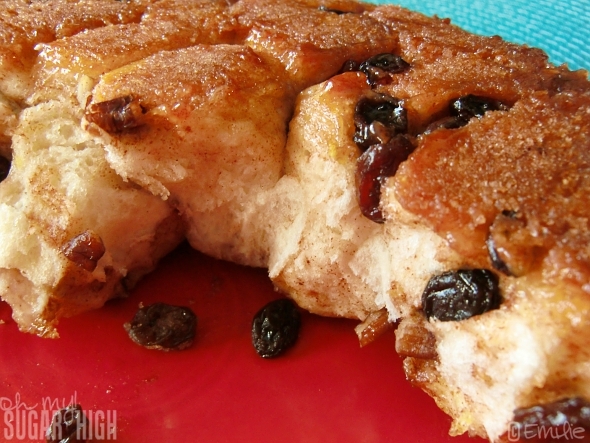 It looks like a serious comfort food dessert, and those are the best kind! Sounds absolutely wonderful!